It was, by all accounts, a hockey night to remember. 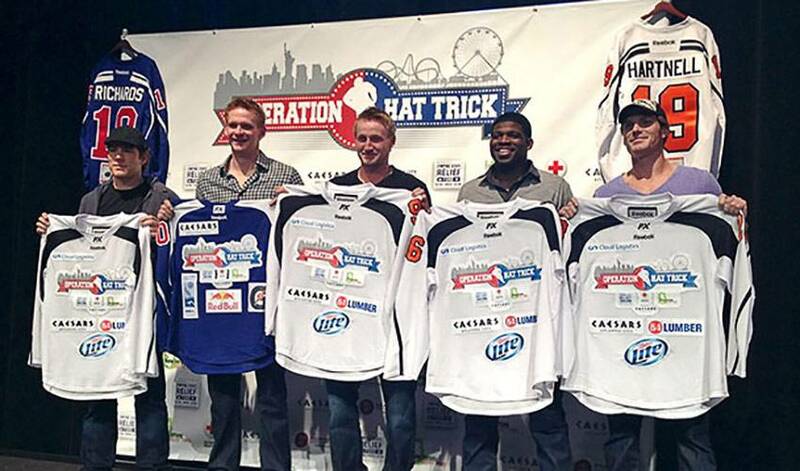 On Saturday, November 24th in Atlantic City, New Jersey, a group of NHLPA members took to the ice for Operation Hat Trick, a sold-out charity game that will benefit the Empire Relief Fund, N.J. Hurricane Sandy Relief Fund and the American Red Cross. Brad Richards and Scott Hartnell acted as the captains of the two teams, with Team New York (Richards) coming out on top against Team New Jersey (Hartnell) by a 10-6 count. And while Hartnell might have had the ‘C’ sewn on his jersey for the game that was orchestrated to help families affected by Hurricane Sandy, it was a group effort for a good cause that had the veteran forward beaming. In late October, Hurricane Sandy devastated portions of the Caribbean and the Mid-Atlantic as well as the Northeastern United States. Over 250 people lost their lives. Damages were pegged at $52-billion dollars. Todd Fedoruk, one of the main organizers of Operation Hat Trick, felt the game would be an ideal way to assist those affected. Hartnell was quick to get on board. “You can’t even fathom what these people are going through,” said Hartnell. “Seeing it on television, reading about it – it was horrific. And that’s why I believe the guys wanted to do something to help. We might not all be from the areas that were affected, but that didn’t stop anyone from getting in touch to jump in and lend a hand. Hartnell was joined by Henrik Lundqvist, Steven Stamkos, Daniel Alfredsson, Corey Perry, Marc Staal, P.K. Subban, Justin Williams, Andy Greene, David Clarkson, Dan Girardi, Matt Martin, Martin Brodeur, Bobby Ryan, Kimmo Timonen, Braydon Coburn, James van Riemsdyk, Simon Gagne, Ville Leino, Daniel Carcillo, Steve Eminger, Jeff Halpern, Brian Boyle, Jody Shelley, John Carlson, Taylor Pyatt, Steve Downie, Wayne Simmonds and James Neal. Along with the Player’s involvement, the NHLPA also made a donation to Operation Hat Trick, while the players autographed equipment which will be auctioned off. Jeff Halpern, who attended Princeton University in New Jersey, and is a member of the New York Rangers, was eager to be involved. “To see what people have endured, the losses they have suffered, it really hits you,” said Halpern, who has family that live in New York and New Jersey. “We wanted the people in the stands to have a little bit of enjoyment and we wanted to help out those who truly need it. Don Marrandino, Eastern Division President for Caesars Entertainment, got good measure of how Operation Hat Trick would turn out days before the actual puck drop. “The level of commitment from these hockey superstars is amazing - we are literally fielding calls on an hourly basis from players looking to do whatever they can to help raise money for Operation Hat Trick,” said Don Marrandino, Eastern Division President for Caesars Entertainment. “With this lineup led by Richards and Hartnell, world-class sponsors on board, and the overwhelming demand for fans to see a hockey game, this event was a natural hat trick right from the start. “We’re proud to be affiliated with such an historic event and humbled by the unselfish support from these athletes,” continued Marrandino. Athletes who still maintain their competitive edge regardless of the nature of the game they’re playing in. But, in this instance, they all know what the bottom line is. At a time of year when the spirit of giving is front and centre.